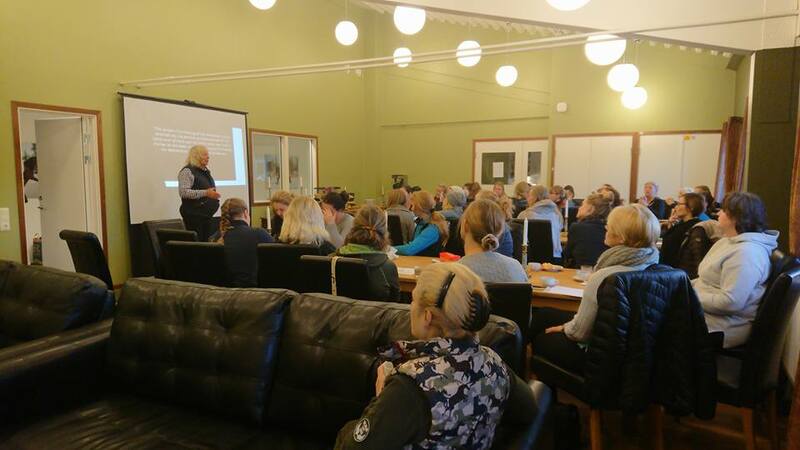 The clinic was held at Sanna Nilsson Dressage Center just outside of Eskilstuna in Sweden. It was worth travelling for ten hours by car to stay at this fantastic site. 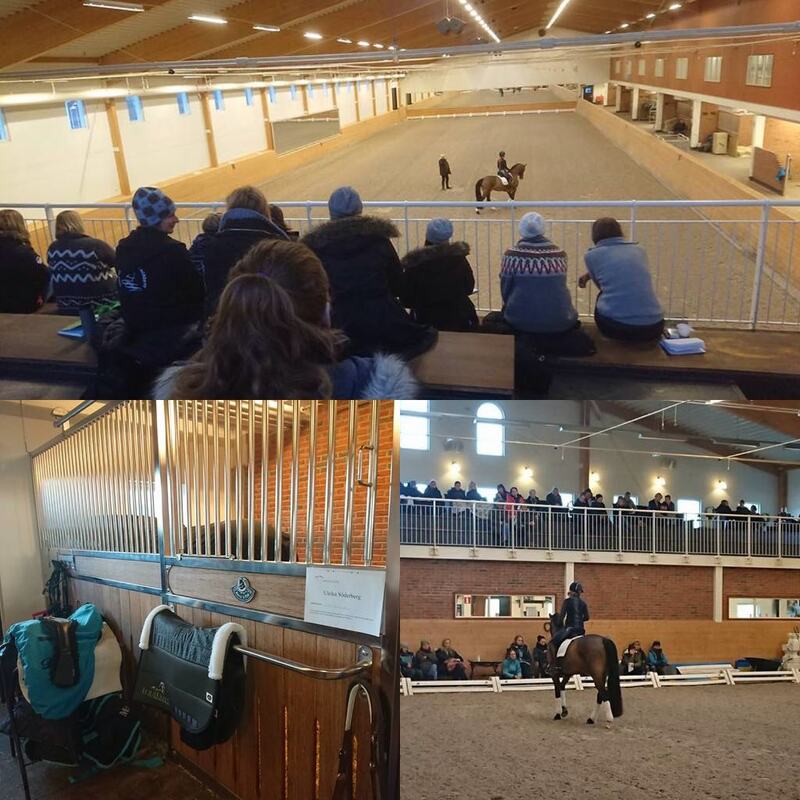 Large, well ventilated and warm (13˚C in the riding arena), everything under one roof, clean and modern everywhere, as well as great food. We simply felt well cared for! It is popular to focus upon the release of tensions in the horses’ muscles and to loosen up the horse so that it relaxes. But according to Jean Luc this is not how it works. The horses’ skeleton is held up by muscles, tendons and fascia, that need a certain tension to keep the bones in their place. If those tensions are released, the stability of the joints is lost. Muscles and tendons both create movements in the joints of the skeleton and stabilises the joints. The fascias’ job is to hold the bones and the joints in place and also to keep them separated from one another, to avoid direct contact. There should be always be some millimetre room between the parts of a joint. This way, the fascia protects the joint and cartilage from damage and abrasion by friction. Some tension is needed for the fascia to be able to work properly. Every horse has its own cadence. Thereby is meant a beat (takt) on which the horse can work optimally. In principle this is not a specific beat, but an interval of beats within the horse works correctly. The velocity of this beat is different for every horse. One horse will have a slower beat and another horse will have a faster beat. If a horse goes in a faster beat than its body is constructed for, the body cannot work correctly. This is valid for all paces; walk, trot and canter. In this case, the force of the hoofs hitting the ground is greater than the fascia can bear. This means that bone and cartilage in the joint will touch which causes damage and injuries after a while. Many riders have learned that balance in the horse is created by moving the horses point of weight backwards through the use of half halts. According to Jean Luc this does not work. The horse does not take more weight on the hind legs. Instead, the horse carries weight with its hind legs for a longer time every step. We have also learned that the horse pushes with its hind legs as soon as the back hoofs are set down. Although, this is not really how it works. Instead, the horse brakes with its hind legs when the hooves are set down. This is visible by the fetlock being lowered in the moment (and if the horse was to slip, the hoof moves forward). In this very moment, that the muscles and tendons store energy that later will be freed and used when the leg pushes off the ground. When the body moves forward so that the leg passes the vertical, the braking of the leg stops and instead the leg thrusts the horse forward. The force of the push (thrust) of the hind legs moves into the horses’ spine via the ilio-sacral joint. There, the force is transferred through every vertebra in the spine and continues to the front legs which then must carry more weight. This extra weight makes the front legs store more energy (in the same way as the hind legs does) in its muscles and tendons, that in the next moment is used as an upwards force, (lifting the horses front). If we put a rider on the horses’ back, we destroy the balance in the horse by straining the front legs with too much weight. When the weight on the front legs becomes too much, muscles and tendons cannot store all the energy and recycle it upwards. Instead, the weight is just moved between both front legs. The steps become low and long, and the weight never lifts from the front of the horse. In this case, the mechanics of the horses’ movements is destroyed. The weight on the front legs is higher than what the structures can bear and by this the joints become strained, which after a while leads to injuries and abrasion. We have to teach the horse how to coordinate its muscles to work correctly with its body. Once it has learned to work correctly, it is no longer more difficult to perform a piaffe than to walk on a circle. In a piaffe, the breaking phase of the hind legs is enhanced so that they break a longer time during the strides contact phase with the ground. At the same time, the forward thrust is minimized, as the horse is not supposed to move forward. Instead, the front legs perform most of the pushing during the piaffe, creating a higher step. If one instead tries to engage the hind legs more by using a whip, the coordination of the muscles will be disturbed. The horse will continue to thrust with the hind legs but the push will be directed upwards, lifting the horses hindquarters. By this, weight is transferred to the front legs, which then will be strained too much. The longissimus dorsi muscle goes from the pelvis to the spinal processes at the withers, which are supposed to lift the horses front. This can only take place, if there is some tension / muscle tone in it. There are also multifidius muscles helping to transform the force from the thrust of the hind legs into an upwards directed force. The horses spine does not really move very much. It can not move more than 53,1 mm in a vertical direction. The rider experiences movements significantly larger than this, because in the seat not only the swinging of the spine can be felt but also the force from front and hind legs. The task of the muscles in the horses back is actually not to move the spine, instead they stabilize and protect it from larger movements than what the spine is constructed for. To do this, they need to have a certain muscle tone all the time. When the rider relaxes and follows the horses’ movements, the riders lower back swings strongly as a result of the movement in the horses’ legs. This movement causes tension in the horses’ back because it tries to hold against a to large, damaging swinging in its own spine. The rider should therefore not only sit and relax and follow the horses’ movement. Instead, the rider must have some muscle tone to not experience such large movements in the spine. The horse is interested in comfortable, easy and energy saving work. This is something the horse all the time thrives after in training. This does not mean that the horse is lazy. If we can show the horse how to coordinate its muscles in a correct way, the work becomes easy and energy efficient. What we during training experience as resistance in the horse is in principle just the horses will to protect itself from damaging movements and movements that cause pain. All horses will make mistakes during training. This does not mean that the horse isn’t obedient, but it is the horses’ way to tell the rider that something in its muscle coordination is not right. Reading the mistakes that appear we can get a clearer picture of how to explain to the horse what it should do differently. Then the horse will make new mistakes and we improve our explanation accordingly until we have guided the horse to the right response. Rewards are not needed as the horse feels how comfortable, easy and energy efficient the work becomes, which is a big enough reward. So in this training neither rewards nor punishment is needed during training, as this is already included in the concept. Horses do not react in the same way all the time. Therefore, communication with the horse is needed at all times to constantly analyse the horses’ movement and the mistakes that appear to guide the horse to a better coordination. This dialogue will always continue. The horse will never be able to coordinate its body on its own, but will always need the dialogue. No matter how well educated the horse is, it will always protect its problems, its muscle memories, its stiffness, its crookedness etc. It will therefore always need more or less help from its rider. One can never expect the horse to be the same from one day to another. Therefore, the riding and dialogue with the horse must be adjusted according to how the horse is just that day at that time. The better the horse has learned to coordinate itself, the more perceptive it will be to the riders’ aids. The rider must adjust the aids to the horses’ development. In the beginning, maybe stronger aids are needed, but they must become finer in tune with the horses’ education. We shall not control and dominate the horse, but communicate with it. The horses’ hind legs consist of many bones. The construction of the joints in the hind legs is very complicated. When the horse moves its hind legs, a complex system of movements in the different joints is put into action, which not only angles and straightens the leg but also rotates. All these different movements in the different joints must be coordinated and work together. Riders are often taught to engage the hind legs more to make the horse lift its back and work correctly. Looking at how complex the movement of the hind leg actually is, it becomes obvious that this does not work. If the rider tries to for example get the horse to bend the hock more, the horse will feel very nice and well bearing for some weeks. By this, the coordination in the hind leg is disturbed and the joints get stressed. This starts an abrasion process which will lead to lameness. If the horse does not engage its hind legs, it is easy to conclude that the horse is lazy. But this is not the case. In reality, the coordination is faulty in some part of the hind leg. The purpose of the navicular bone is to confirm that the angle of the deep flexor tendon towards the navicular bone is always the same. The flexor tendons attachment in the navicular bone is a mixture of a tendon and a bone. If the angle of this tendon becomes faulty, stress is induced in the area, causing inflammation. This causes the navicular syndrome. It only leads to lameness if there is an acute inflammation in the attachment of the tendon. The hock consists of several small bones with joints in between. The two lower joints rotate in synchronisation with the rotation of the fetlock. The two upper joints rotate in coordination with the stifle. If the rotation of one of these joints is not completely in sync, stress will occur in the tendons and bones in the hock, causing injuries and lameness. The stress can also lead to arthritis in the hock, a condition called spavin. Depending on how the synchronisation is faulty, the arthritis can appear in different parts of the joints. If the horse is ridden long and low, the movement in the lumbar spine minimises and the croup flattens. The hind legs are set down earlier and the forward thrust is increased. The hock straightens, which leads to stress in its lower parts. If the horse has too much movement sideways in its pelvis, the hip will move forward more, when the respective hind leg steps forward. The hind leg will be set down too far forward in relation to its upper parts. This stresses the middle parts of the hock. This kind of strain leads slowly but surely to damage in the joints, but it can take years before the horse shows signs of lameness. The faulty synchronisation of the movements in the hind leg doesn’t only lead to damage but also to worse performance of the horse. Of course, the horse feels the stress of the joints in the hind legs and will protect itself by engaging them less and less. A horse should have a bouncing trot. If a horse has a flat trot, it is not engaging its hind legs properly. This means that the horse after a while will become lame. If the horse lowers its chest, the suspension in the thoracic spine, bending and rotation become worse. The protective mechanisms of the horse cause stiffness in these parts, which is compensated by an increased lateral movement in the pelvis. In piaffe, the horse should actually set down its hind legs further back than in collected trot, simply because the piaffe does not include a forward movement of the horses’ body. If the hind legs are too long in under the horse, the hock is straightened, which is damaging for the horse. There is a big difference between teaching a horse a movement, for example piaffe, and teaching the horse the coordination to perform the movement. The splenius muscle and cervical spinalis capitis run along the neck on top of the spinal processes. The vertebrae of the neck can of course not change in length, but the cervical spine and the neck can change form. The horses head is held up by the muscles of the neck that sit on top of the spine. Gravity pulls the horses head down all the time. When the horse lowers its neck, the force comes mostly from gravity instead of muscular engagement. The Nuchal ligament is situated along the upper line of the neck, fixed to the firs 4-5 cervical vertebrae. When the horse adapts to a “dressage form”, the Nuchal ligament is not engaged at all, but only the muscles hold up the horses head in this case. When the head is lowered, the Nuchal ligament starts to support the muscles. The muscles of the upper neck will still do part of the work, but not as much as in a higher form. These muscles work against gravity all the time. They never relax and never stretch but are always more or less contracted to work against gravity. The Nuchal ligament is strong between the spinal processes of the withers and C2, but quite weak between C 2 and the atlas. This is the reason why the horses’ head can so easily be pulled behind the vertical. 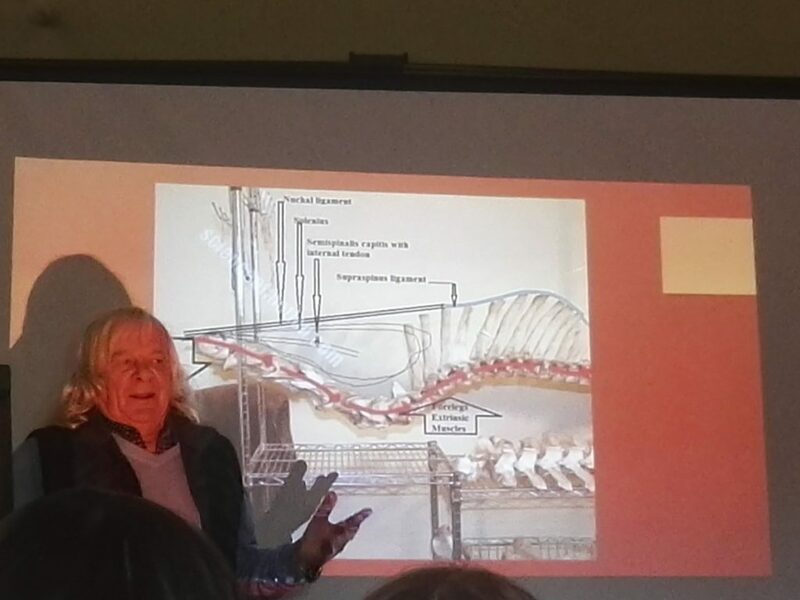 The Longissimus dorsi is not only one muscle that works homogenously, but a large number of smaller muscles, working in a complex system in beat with the horses movements. All these muscles do not contract and release at the same time, instead some will contract at one moment in the horses’ movement and others will contract at another time. What happens when the horse goes long and low? The theory that the horse would lengthen its upper line by contracting its lower line does according to Jean Luc not work practically. The muscles on the horses back are really strong and the muscles of the bowel are thin and weak. There is no chance that these muscles could lengthen the horses upper line. Their job is to hold the horses’ internal organs in place. Gravity pulls the horses head and chest downwards. The serratus muscle is working against gravity to lift up the chest. As a consequence, there is upwards directed muscular force approximately by the wither. The Nuchal ligament and the supraspinous ligament are in principle the same ligament, covering the complete upper line of the horse. It is more elastic in the neck and becomes less and less flexible further back. Gravity that is pulling down the head is withstood both by these ligaments and the muscles in the cervical spine. The sum of these forces is transferred backwards through the vertebrae in the cervical spine, creating an upwards directed force in the thoracic spine. The verticalization of the long spinal processes create a rotation of the vertebrae, creating the feeling of lift in the withers. Actually, it is only the rotation of the vertebrae that tilts the spinal processes forward, making them higher without there being an actual lift. Instead, the forward tilt increases the strain on the front legs. Science shows that the movability of the lumbar spine is minimized when the horse goes long and low, including even the movability in the last thoracic vertebrae, but increased movement in the thoracic vertebrae in the front. The lowered mobility is compensated by increasing movability in the lumbosacral joint. In history, many masters have promoted the idea that the horse should be ridden with its head high up, to minimize strain on the fore legs and to engage the hind legs. Just as many masters of riding have promoted that the horse should go with the head long and low to lift the horses back and to engage the hind legs. Neither of which builds on scientific research. Jean Luc thinks, that the horse must lengthen its neck, but should not go in a low form. Which position is optimal for the head depends on how the horse is built. If the head is too high, the nuchal ligament is disengaged and cannot support the muscles in withstanding gravity. If the head is too low, the chest is lowered and the strain on the front legs is increased. Every horse has an interval within it can most efficiently withstand the force of gravity with both ligaments and muscles. Jean Luc thinks therefore, that there is no reason to lift the horses head as high as for example Baucher, Fillis and others suggest. The horse is able to activate the muscles of its neck, even if the head is somewhat lower and longer, but not too low. So there is a position for the horses’ head to be in that makes it easier for the horse to lift the chest and coordinate its back muscles correctly. The horse will tell the rider, where that position is. The horse will by itself choose this position after having learned to coordinate its muscles and lift its chest. If the rider tries to position the head for the horse, the risk of guessing wrongly is quite big. When the horse is working correctly for some time, its chest becomes wider across its shoulders, as the muscles lifting the chest become stronger and well trained. Åk på semester med din häst! Kom till Ridakademi Norr som veckoelev! De flesta veckor går att boka. Copyright © 2019 Katrin Wallberg på Ridakademi Norr. Designed by Klasik Themes.